Please note: I was NOT paid to write this article NOR was I given the product in exchange for a review. I also have NO financial interest in this company NOR do I stand to benefit financially from sales of this product. In other words, I am in NO WAY affiliated with this company. There are NO affiliate links in this article. I received the product to sample at my own request. I am sharing my results here in hopes that others may benefit in some way. Even though I’m experienced at the ketogenic way of eating as well as extended fasting, I wondered what it would be like to be “instantly” transported to that magical level of deep ketosis without the lengthy process it normally takes to get there. Enter "ketone esters". 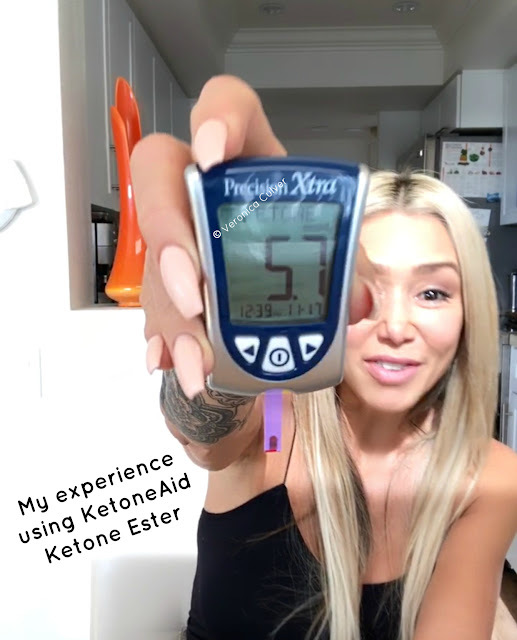 But before I get into what ketone esters are and my experience sampling KetoneAid (a ketone ester), www.ketoneaid.com, let me back up just a bit and set the stage. Dr. Joseph Mercola, www.mercola.com, defines ketosis as “a metabolic state in which your body burns fat rather than glucose as its primary fuel”. While some may define "ketosis" slightly differently, I believe Dr. Mercola hits the nail on the head, which would be further defined as endogenously creating ketones, meaning your body is producing them naturally through means of your dietary choices. These are reported benefits that were attained via endogenous ketone production and not "necessarily" via exogenous ketone production (the kind of ketones you might get from taking a supplement). For some of these benefits, like seizure control for example, it's too early to tell if this benefit might extend to drinking a supplement. Some others, such as increased mental focus, are fairly easily tested, hence my experiment outlined in this post. Eat a diet that is mostly comprised of high-quality fats (about 80%), a moderate to low amount of protein (about 15%) and a very small amount of carbs (about 5%). This is often referred to as Nutritional Ketosis, meaning your body has achieved a state of ketosis (or burning fat for fuel) by creating its own endogenous ketones through eating according to the prescribed macros. This is my preferred method as it is the most sustainable and natural method, albeit way more difficult than supplementing with exogenous ketones. With that said, why might you want to use a supplement or aid to achieve ketosis? KetoneAid's ketone ester drink falls in the exogenous ketone category and is essentially D-beta hydroxybutyrate (D-BHB) ketone bodies at 10x more D-BHB than you’d get from ketone salts which are a combination of D and L-BHB. To clarify, ketone esters and ketone salts are both exogenous ketones. Both contain BHB but different varieties. KetoneAid uses D-BHB and it allows for a much higher concentration per serving. Ketone salts are BHB (D and L) that have various bases, making various salts which limit the max serving you can consume at one time, thereby lessening their efficacy, especially when compared to KetoneAid. At the time of this writing, KetoneAid is the only commercially available form of ketone ester drink I personally know of and even it is not “readily” available just yet. Although professional competitive athletes have been using ketone esters for years, it’s still very early in the consumer marketplace for a product as potent as this. Currently KetoneAid has an Indiegogo campaign, you can see it here (actually it’s their second Indiegogo round and it closes very soon, with a delivery date for that batch to be released in March 2018). So, while it is technically available to the public, you’ll just have to be a bit patient in waiting for its delivery should you decide to purchase. Again, I have no financial interest in this company and will not gain anything one way or the other. My hope is that over the next few years, it becomes much more commercially available as I feel the benefits are tremendous for a wide range of everyday people, like myself, not just professional athletes. Supporting reputable manufacturers such as this will help bring their products to market quicker and drive the price down benefitting all of us. You’ve never been in nutritional ketosis and wonder what it feels like and if it really does work to turn off hunger and cravings resulting weight loss, to enhance physical performance, and to increase mental performance, etc. You’re looking to perform better in a sports-related activity, for instance crush a 5k PR. You’re looking to experience a flow state but don’t have time to participate in a 5-Day Fast - defined as no food or drink except water, tea and coffee for 5 full days. The answer is a resounding YES! My baseline ketones went from 1.2 prior to taking KetoneAid to 5.7 within 15 minutes of taking the product! I could hardly contain my excitement yet at the same time I was in total disbelief. I’d tried ketone salts previously and not seen any ketone shift at all. I recognize others do, however for me it did not measure any difference at all. Back to my experiment. Over the next couple of hours my ketones continued to rise peaking at around 6.7 and then starting to come back down to what would still be considered well into ketosis – 2.9. During this time, I definitely felt all of the amazing effects of deep ketosis – creative flow, calm happiness, energy, little to no hunger, etc. I got a tremendous amount done – everything from creative and administrative work to cleaning and organizing around my house. I felt energized but never jittery. It's a difficult thing to explain unless you've experienced it yourself, but trust me - it's a great space to be in. By the end of the day, though, I was completely exhausted. Apparently, I went beyond my ideal ketone range and overstimulated myself. I didn’t feel bad, just very, very tired. I slept incredibly well that night. In the future, though, I would split my servings out to say 15g and 15g (the total of 30g is based on my body weight, approximately 110 - 114 lbs.). I think this would extend the benefits for a longer period of time as well as optimize my experience. Regardless, I'd say this experiment was a success! It definitely did mimic a 5 day fast and I achieved a flow state within minutes – so crazy! I can see how this would be particularly beneficial for someone who’s never experienced this state and/or has never been in ketosis at all. I mean how do you know what you’re missing if you’ve never experienced it? It seems to me that it would be more motivating, and a person might be better able to successfully endure the “carb flu” while trying to switch to fat burning IF they could simulate the deep ketosis experience whereby they get to feel how it really is on the other side. One time trying a ketone ester such as this would be all it would take to understand "that feeling" and hopefully provide the motivation to stick with the diet long enough to get to experience the results. I think it's important to note that the relative cost for this type of supplementation is negligible. At around $1 per gram or $10 for a 10g serving for KetoneAid (a serving size that could actually allow for skipping a meal) this could easily be considered a wash financially. And with the ketone ester, you'd also get to realize a multitude of other benefits, so from that perspective, you'd come out ahead. What do you think? Would you ever try a ketone ester? PS - I’m planning another experiment using KetoneAid on Thanksgiving Day. One where I test the product’s ability to quickly get me into my sweet spot of ketosis - the level where it curbs my hunger and cravings even in the face of some of the most tempting of food situations - and then stay there for an extended period of time (throughout the day and hopefully evening). I will do this by splitting my serving size up into two or three servings. Will update this post with my findings and will include a section on "how to optimize" your ketone ester experience. I wondered if KetoneAid's ketone ester could sub in as the ultimate appetite suppressant? By "sub in" I mean in lieu of being naturally (via your diet and fasting) in deep nutritional ketosis, or somewhere in the 3.0 - 5.0 mmol range for a healthy adult with normal blood glucose levels. Normally I would only be in that level of ketosis if I had been fasting for several days. I ended up feeling so optimally that I never took that second 20g serving. I was able to think about what I wanted to eat, not what I was "craving", and choose wisely. Normally I would have filled my plate and possibly inhaled it without even thinking. Later I would have likely regretted it. But I was able to enjoy the social aspect of our family event and nibble happily on foods that were definitely on my normal plan. It was all just so “easy”. I simply snacked on the healthier food choices available and avoided the foods I knew would have me on a sugar-high-food-coma roller coaster all afternoon and night. This left me with plenty of free time and positive energy to socialize with everyone and enjoy the party. I realize for some this may not be a challenge, but for me it is. I have all sorts of attachments to foods from my childhood, and certainly when I'm around family and surrounded by those unhealthy foods, the attachments have a way of feeling like addictions. I've mentioned this in some of my fasting videos in fact. When I'm 3, 4 or 5 days into an extended fast is when I feel completely and totally free of these "attachments". At those times, you could throw me into a pool of cream cheese frosting and give me red velvet cupcake floaties and I'd still feel totally fine not partaking. Now, that's the ultimate in appetite suppression if you ask me. With that said, I want to wholeheartedly recommend this product. I know you can get there by being in ketosis naturally and by fasting 3-5 days but what if you've never done that. It's just not that easy to do if you're not experienced at it. And further, unless you're properly motivated, most won't even attempt it. Or they may try the ketogenic diet for a few days and then give up once the carb flu sets in. If you could see what ketosis, and especially deep ketosis, feels like by taking this ketone ester and experiencing it for yourself, even just once, well that might be enough motivation to continue and stick with the ketogenic way of eating. And that's just one use of this ketone ester. There are many others. I haven't even touched on the sports performance aspect. Nor the supposition I've come to make that a person "might" even be able to avoid getting the carb flu altogether if they were to take this ketone ester every day for a couple of weeks and follow the ketogenic diet along with it. This is merely a supposition on my part. Regardless, the Trainer size bottle to me feels like the hands-down way to go. You get 300g and you can divvy it up however you like, over however long you like so you have the opportunity to use it in multiple applications as well as find your optimal serving size for your desired result that day. It's best to take KetoneAid on empty stomach. Wait to take it until you would normally have had your first meal of the day, or just take it when you start to feel that first little grumble of hunger. Take the serving size based on your weight that will have been recommended by KetoneAid - for most that's a 30g serving. Esters are notoriously foul tasting. KetoneAid isn't that bad. In fact, it's kind of sweet due to the flavoring they've added to make it more palatable for the average person. For an optimal taste experience, store KetoneAid in the refrigerator so it's chilled and ready when you are. When you're ready to take your serving, prepare yourself for a really bad flavor and do it like a "shot", all in one gulp, immediately chased by cold sparkling mineral water. Then it won't seem "so bad". Just remember, no matter how bad you think it tastes, once you experience its results, you'll realize it was worth it! After you've taken KetoneAid, get up and walk around, maybe go outside, breathe in some fresh air and soak in your surroundings. Make note of how you feel. Smile and enjoy feeling quietly energized. Make a plan beforehand of what you want to accomplish once you've gotten into deep ketosis. For instance, a project you want to work on or complete. Being deep in ketosis, even exogenously, has its benefits - like creative energy. You'll want to capitalize on the hours of flow state you'll hopefully get to experience. Invest in a ketone meter and strips for measuring your blood ketone and blood glucose levels if you don't already have one (the urine sticks won't cut it). Monitor your ketones and glucose regularly both with and without taking KetoneAid so you can establish benchmarks and track your progress. I hope this article is helpful, otherwise I will have wasted a TREMENDOUS amount of my time and effort for nothing! Would love to hear your thoughts in the comments! 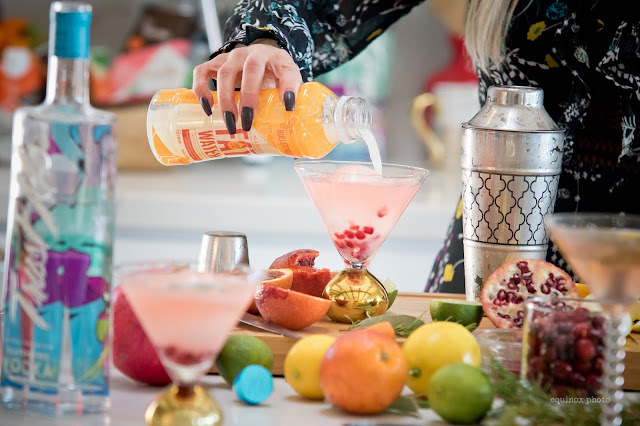 This holiday season, I've partnered with Trust Me Vodka, an amazing gluten-free vodka that tastes every bit as great as their artistic bottles look. They offer an organic version of their vodka, as well as this gluten free. 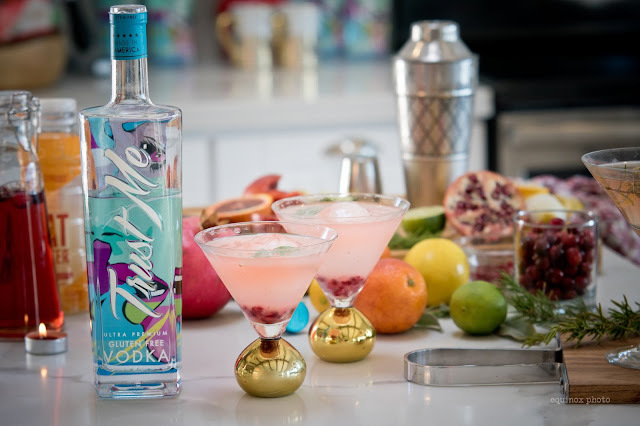 This vodka tastes clean and light, making it the perfect addition to any cocktail. I've created several holiday-themed vodka cocktails that are also Bulletproof Diet friendly so you can stay on plan and hopefully hangover free throughout the holidays. Drinking alcohol is not technically "Bulletproof", however if you are going to drink, you'll want to minimize the negative effects you get from a typical cocktail that is most likely a sugar/carb/gluten bomb - a recipe for hangovers and weight gain. You might also want to leverage this alcohol guide published by Bulletproof. I personally swear by their Bulletproof Coconut Charcoal and always carry it with me. The first recipe I'll share is this White Sage Elixir Martini. It's mildly sweet despite not having any added sugar - thanks to the addition of Bulletproof FATWater infused with B vitamins and Brain Octane. The blood orange falls in the “suspect” or yellow zone of the Bulletproof Diet Roadmap. There is only a small amount (juice of 1/2 an orange, or approximately 1 ounce) in this drink however, please be aware in case you are sensitive to oranges. The fresh sage adds a dimension that doesn't overpower yet is noticeable in just the right way. And let's face it, this cocktail is stunning to look at. Impress your friends with this craft cocktail that is actually very easy to make. Fancy ice cube optional. Fill a cocktail shaker half full of ice and add Trust Me Gluten Free Vodka, blood orange juice and lime juice. Shake well, then strain into an ice-filled rocks glass that has been rimmed with fresh sage (just rub the rim of the glass with the sage). Smack the sage between your palms to release more of its aromatic oils, then place the leaf in the cocktail. Top off with FATWater. 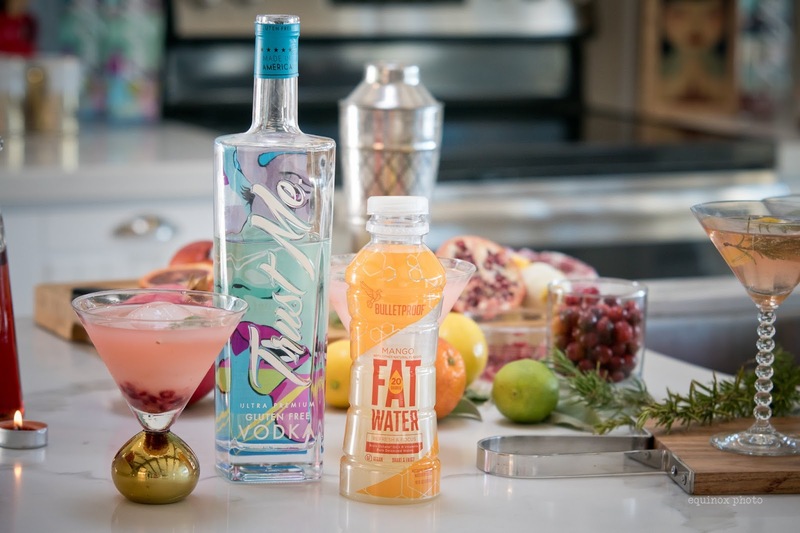 FATWater is delicious and adds just the right amount of sweetness to this cocktail without adding any sugar. It’s also infused with Brain Octane oil and B vitamins to help keep you hydrated and hangover free. 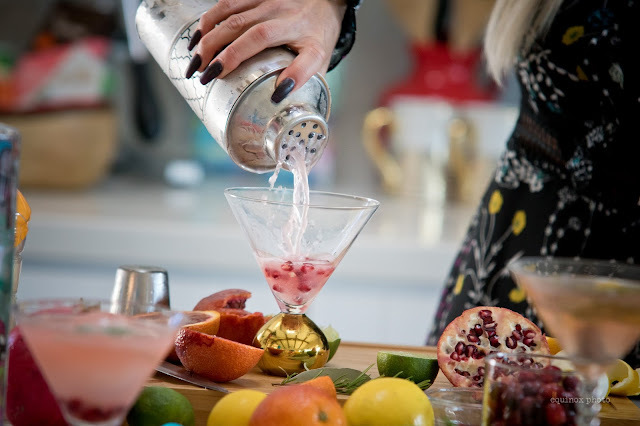 Optional: Add a teaspoon or so of pomegranate arils to the cocktail for a splash of red color. You may also consume the arils which are a source of vitamins, like vitamin K and C, and polyphenols. Optional: For an extra special presentation, use a fancy ice cube like the round one pictured and float the sage leaf on top before serving. 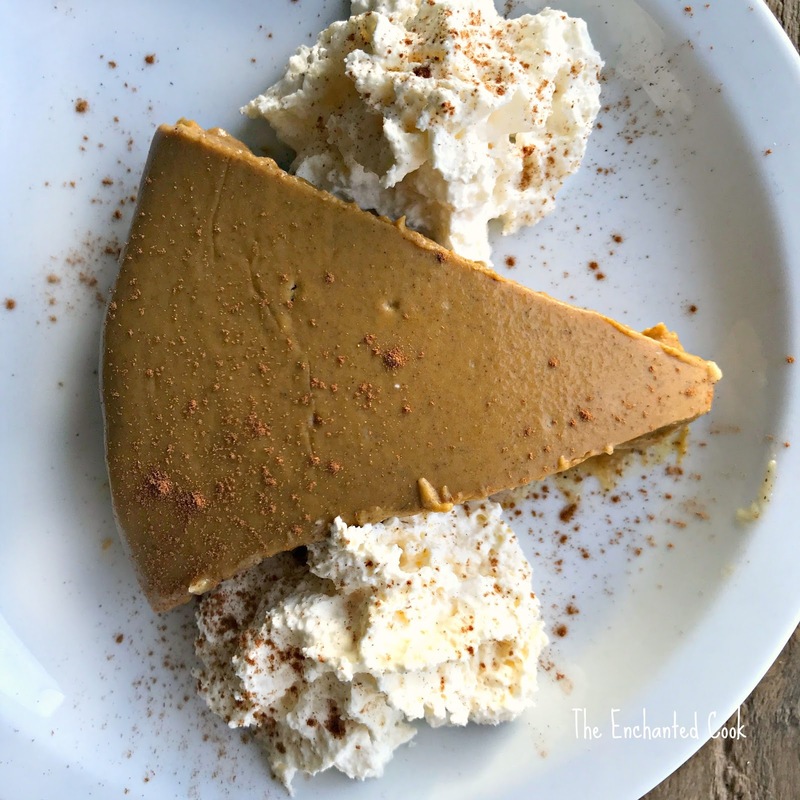 Easy No-Bake Pumpkin Pie - creamy and luscious! 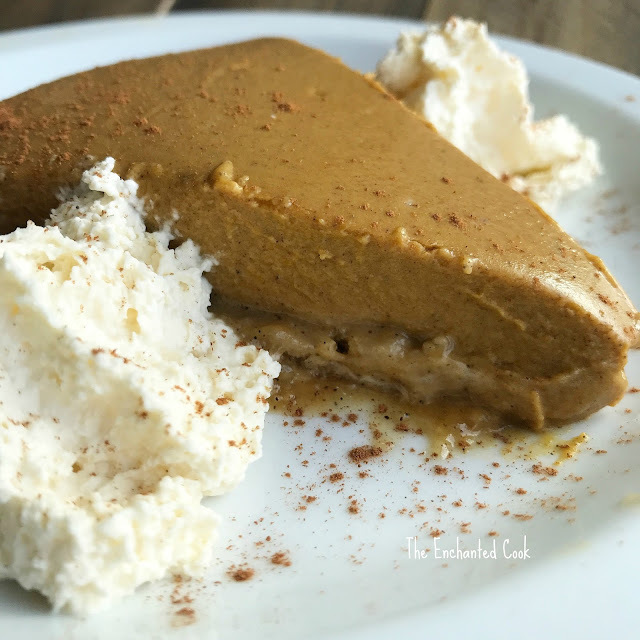 This year at Thanksgiving, I'm keeping it super easy, as well as Bulletproof and Paleo, and making my Easy No-Bake Pumpkin Pie. It's absolutely perfect for Thanksgiving, or any time for that matter. In fact, I make this often and just have a slice any time I want a guilt-free dessert. It's lusciously creamy and full of pumpkin spice goodness. Place everything in a saucepan over medium heat and whisk together until well incorporated, smooth and warm - about 5 minutes. Remove from heat and let cool while you make your crust. 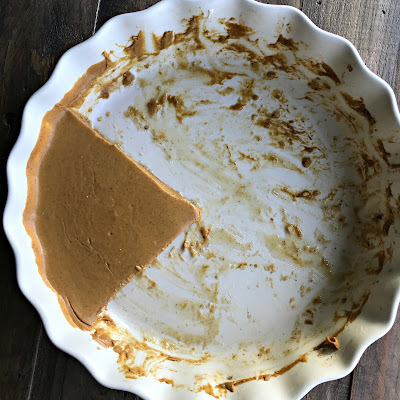 Place both crust ingredients in an 8 or 9" pie plate, mix together and press into the bottom (no need to do the sides, the bottom is sufficient). Place in freezer for 10-15 minutes until the ghee or butter re-solidifies. Remove crust from freezer, pour pie filling in and refrigerate for 6 hours or overnight until pie is set. Store pie covered in refrigerator until ready to serve. Serving Suggestion: Top with fresh whipped coconut cream (dairy free), or raw organic cream, and a sprinkle of cinnamon and serve. *Note: Crust is optional, however the Bulletproof Vanilla Collagen Bars add a sweetness to the overall pie that puts this recipe over the top. Should you decide not to use a crust, you may want to add an extra Tablespoon or two of xylitol to the filling mixture. Bulletproof Bars are available at Whole Foods Markets around the country as well as online at Bulletproof.com. Should you like to create your own crust instead of using Bulletproof Bars, you can use a mixture of almond meal, grass-fed butter or ghee and xylitol. Trust me, it's not near as delicious and doesn't come out of the pie plate near as easily. I've made it both ways, as well as used different Bulletproof Bar flavors, and the vanilla ones just put this dessert over the top. 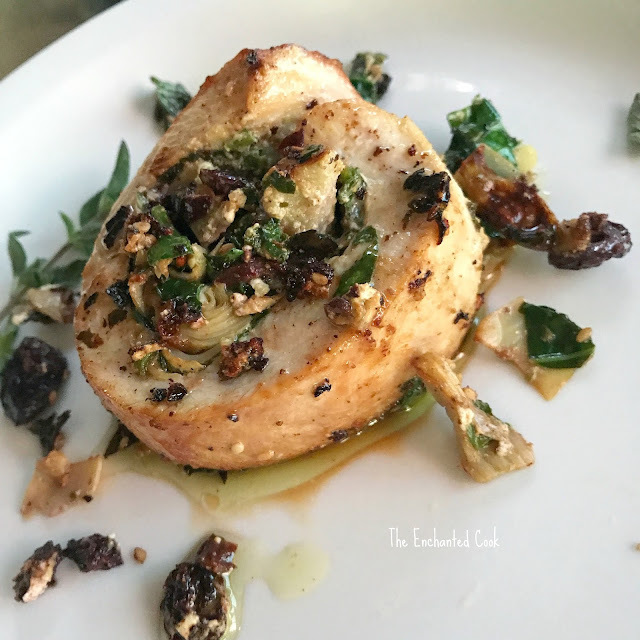 This Mediterranean Turkey Roulade is insanely rich in the most delicious kinda way. 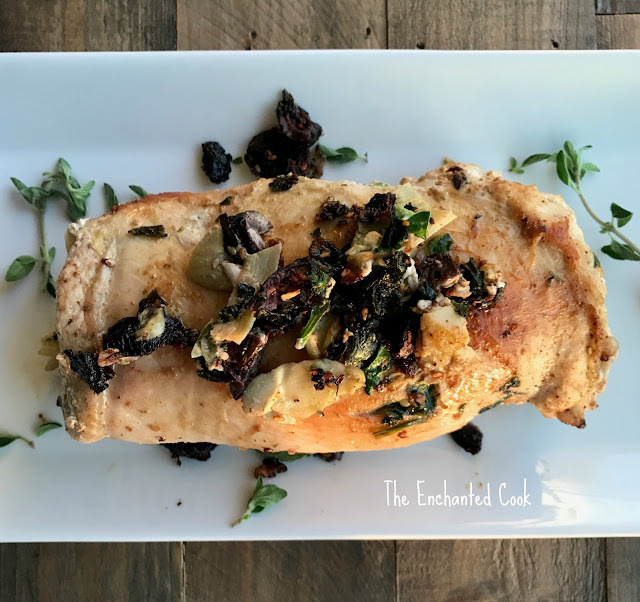 A spinach, feta, artichoke and olive filling is tucked inside a beautiful free range turkey breast cutlet that has been rolled up then lightly dusted in a Dukkah nut and spice blend, and cooked to perfection. A drizzle of olive oil when it hit the plate was the icing. Sure, sure they're South American, Peruvian to be exact. I know, not really "Mediterranean" exactly. But I took one bite of these savory, rich black Botija olives and knew they'd go nicely with some of my favorite aforementioned Mediterranean ingredients. So here we are. Coat both sides of the turkey breast cutlet with the Himalayan pink salt and set aside. 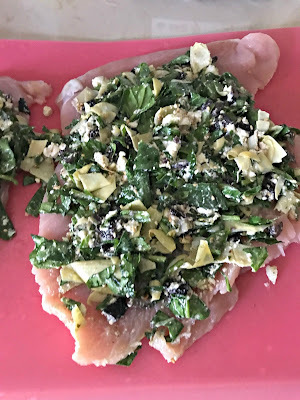 In a small bowl, mix the spinach, olives, artichoke hearts, feta and 1 1/2 Tablespoons of Dukkah nut and spice blend together. Spread this mixture in an even layer on the turkey breast cutlet. Roll up and secure with toothpicks if needed. Sprinkle the remaining Dukkah on the outside of the rolled up turkey breast. Heat a large cast iron skillet to medium high and add a small amount of cooking oil. 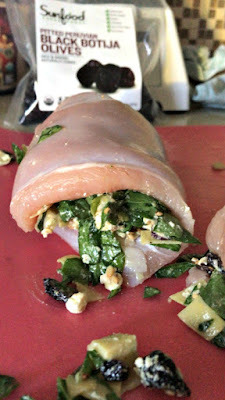 Carefully place the rolled up turkey breast into the skillet seam side down. 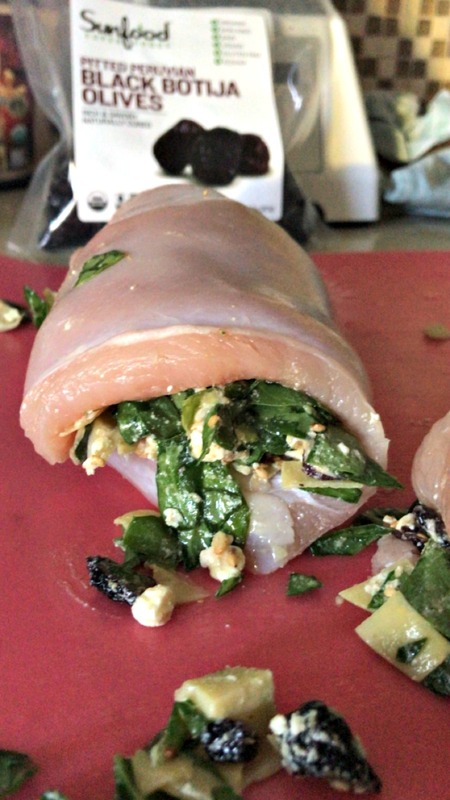 Cook for 3-4 minutes then roll to the side and cook another 3-4 minutes, repeating until all sides are lightly browned and turkey is fully cooked. Remove from skillet, take out the toothpicks if used, slice and serve with a drizzle of olive oil and sprinkle of fresh oregano (optional). If some of the filling escaped into your skillet, sprinkle that on top as well. 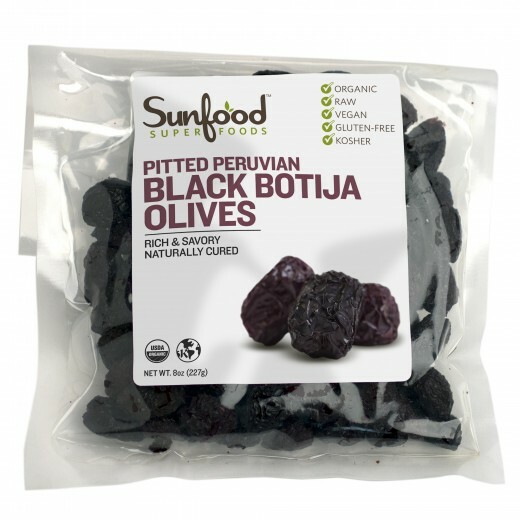 Likely, you will have some crisped olives in that pan and you don't want to let those go untouched. They are simply divine.